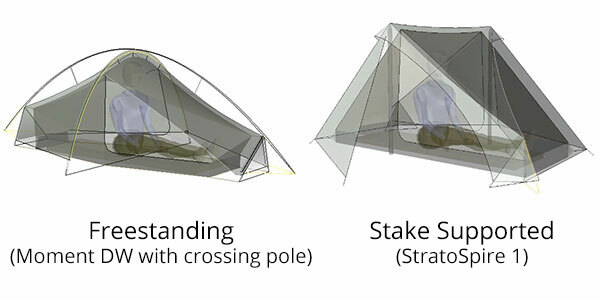 Though tents may seem like simple structures, Tarptents elegantly solve complex problems. Please read through the topics below to familiarize yourself with the tradeoffs and features present in different Tarptents. 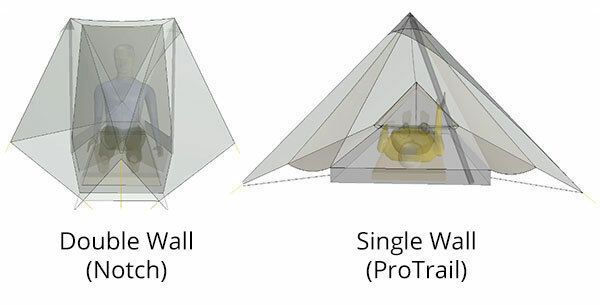 The often misunderstood fact about single versus double wall tents is condensation. Condensation occurs when warm air settles on cold surfaces. Moisture released as you breathe can become condensation as can moisture present in ambient air. Humans exhale about 16 fluid oz / 0.5 liters of water every night and all that moisture has to go somewhere. We make both single and full double wall shelters (all of which are fully enclosed) but there’s no magic about a double wall. All tents condensate. What ultimately matters is whether or not the condensation gets on you and/or your gear. Proper site selection can make all the difference between lots of condensation and little, if any, condensation. Our “How to minimize condensation” video is well-worth watching. For cool, damp environments we recommend a double wall shelter. A double walled shelter does not stop condensation but does have a solid or mesh interior that acts as a barrier between you and the condensation. A single wall tent does not have that which means that, if condensation does form, you may want to carry a small rag to wipe off the inside of your tent. Some of our single walled tents have liners that serve the same purpose as an interior. In addition, some people prefer a double walled tent so that they can set up their tent fly alone or interior alone. A double walled tent may also be warmer than a single wall because there are two layers of fabric between you and the elements, not just one. We offer our double walled tents with either a mesh interior or a [partial] solid interior for 3+ season use. Ready to dive in? Head on over to our Tent Selector! If you are a trekking pole user, we offer a number of shelters that use these poles for setup. Trekking pole shelters are generally lighter because the setup poles are already in your hands and not stored on your back as you hike. If you are not a trekking pole user, you can still use our trekking pole supported tents, with a set of vertical support poles, which are just as stable as a pair of trekking poles. We also offer arch pole supported shelters. Aluminum arch poles span the structure from end to end and/or side to side and maximize interior volume. Pole sleeves (compared to pole clips) tension more of the fabric and make for a better supported shelter in rain and wind. 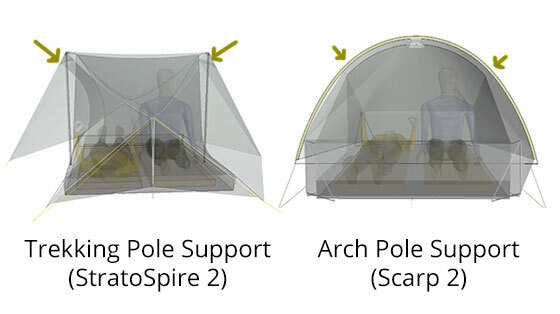 For either a trekking pole supported or arch pole supported Tarptent, employing extra guyline at the apex or perimeter hem of the shelter or along the arch sleeve will greatly improve stability in inclement weather. A free-standing shelter does not need stakes to stand up. Once you’ve assembled it, you can pick it up, move it around, and position as desired in your site. We always recommend that you stake a freestanding shelter to the ground to keep it from floating away in the wind. We have two free-standing shelters as shipped: the Bowfin 1 and Bowfin 2. We have several shelters that can be set up free-standing with the use of optional crossing poles: the Moment DW, the Scarp 1, and the Scarp 2. Please note: those poles add extra weight to your set up, but they also add wind and snow stability. Lastly, we have two tents that can be set up in freestanding mode with trekking poles, the Rainbow and the Double Rainbow. If you are a trekking pole user and want a free-standing tent, one of them may be the shelter for you! All of our shelters (excluding Tarptent Lithium products) use silicone coated 30d fabrics. 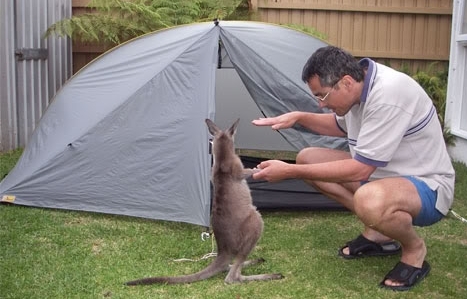 Many other lightweight tents reduce their weight by using weaker, less abrasion resistant 15d, or even 10d, fabrics. Because our floors are made of 30d fabric, we find that a groundsheet (extra layer put under tent floor to keep it from being abraded or punctured) is only necessary in particularly prickly or rough situations. We use aluminum arch and crossing poles on all of our tents. While carbon may be a bit stiffer and lighter, we are trying to achieve the most durable, long-lasting, and affordable tent. In the durability and price vs weight tradeoff, aluminum wins. If your shelter is the recipient of some tough love and needs a little TLC, we are always more than happy to send you scraps of silnylon, mesh, or even some zipper sliders. You can permanently patch silnylon by using silicone to glue a scrap of fabric over the hole. We know of numerous Tarptents still in use after 10,000 miles on the trail. The Lithium product line uses Dyneema® fiber, a laminated fabric made from ultra-high molecular weight polyethylene fiber and mylar film. It is up to 15 times stronger than quality steel and up to 40% stronger than aramid fibers, both on weight for weight basis. In addition, Dyneema® fiber floats on water and is extremely durable and resistant to moisture, UV light and chemicals. In our testing, Dyneema® hydrostatic head exceeds 8,000mm. Fabrics with Dyneema® offer maximum strength and water resistance combined with minimum weight. Once pitched, a shelter made of Dyneema® will not stretch or sag when wet. 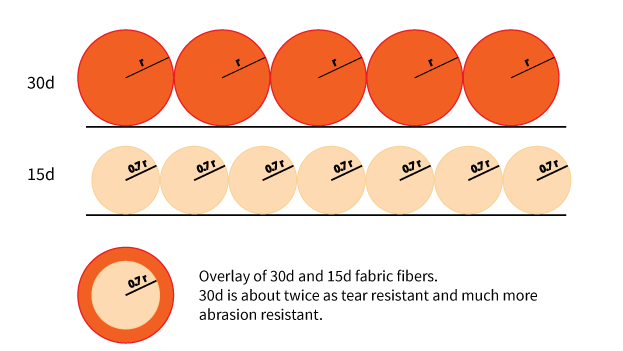 Dyneema® should be rolled, not stuffed, for maximum longevity. Dyneema® fiber and fabrics are made in Arizona and North Carolina. A front entrance shelter usually has one entrance by your head. A double-side entrance shelter has an entrance on either side of your body. Shelters with only one entrance tend to be lighter (less fabric and less zipper). A double-side entrance shelter is generally easier to enter and exit, provides better flow through ventilation, and provides more vestibule storage space. Tent specifications can be very deceiving if you only consider maximum listed floor width, length, and interior height. You also need to consider wall slope, interior volume, and how you fit sitting up and lying down. Most people are half their height when they are sitting up. As for your footbox, a good height estimate is 1 foot, or 30 cm. When you are looking at interior walls, think about where your feet are going to be and how high the ceiling is there. Detailed dimensions for all the shelters can be found on the product pages. We also have interactive 3D models with 6 ft (1.83 m) tall humans inside them to visualize how it feels to be inside a Tarptent. All of the weights listed for tents take into account the stakes, necessary poles, stuff sacks, and guylines for the tent. Basically, everything you’ll need out on the trail/ water/ road/ adventure. When you’re comparing tent weights, don’t forget to take into account the weights of any groundsheet, extra stakes, vertical support poles, or crossing poles that you might want to use. In our product line, a tent that is a single wall, single door, trekking pole supported shelter will be lighter than the converse (a double wall, double side entrance, arch pole supported shelter). 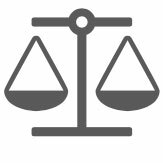 Consider these tradeoffs as you search for the best solution to your needs. 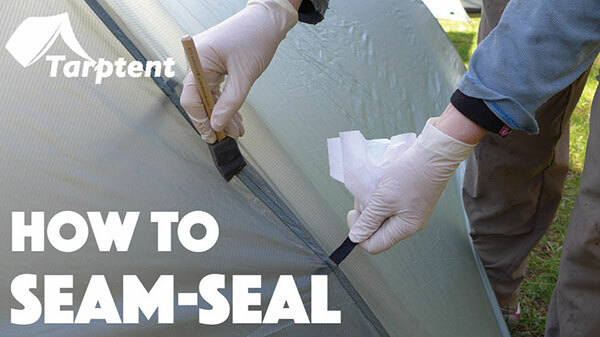 Silicone-coated nylon (Silnylon) tents have to be seam-painted because they cannot be machine seam-taped — Silicone is an inorganic substance that doesn’t take a Poly-urethane (PU) seam tape. Seam-sealing blocks water from entering the seam holes created when the tent is sewn. The good news is that the silicone is very long lasting, so your tent will only need to be sealed once. We do not include this process in our base cost but do offer seam-sealing kits. They include a brush, a glove, and some pre-mixed silicone solution. We also offer a seam-sealing service. The service can add time for your product to ship as it is weather dependant.